1. Place the gammon in a large casserole and cover with cold water, calculate the cooking time according to pack instructions. Cut the garlic bulb in half horizontally and add to the pot with the thyme. Bring gently to the boil and simmer for the calculated cooking time, about 2 hours until cooked through. To check if the gammon is cooked, push a skewer into the centre of the joint – it should give way and feel firm but not rubbery. Then press the skewer to the back of your hand, it should feel hot. If not, continue to simmer for another 15 minutes, then try again. Leave to cool in the cooking liquor. 2. When cold enough to handle remove the gammon from the pan and carefully cut off the rind (if using a rind-on gammon joint). Brush the surface with the mustard then roll in the chopped herbs. Wrap in clingfilm and chill until ready to serve. 3. Meanwhile, for the chick pea salsa, heat 1 tbsp of the rapeseed oil in a large saucepan and gently cook the shallot and garlic until softened but not coloured. Stir in the tomatoes and chilli flakes and continue to cook until pulpy and thickened. Add a pinch of sugar, the white wine vinegar and the chickpeas and bring to the boil. Then remove from the heat and set aside to cool. 4. Place the mustard in a bowl and whisk in the remaining 5 tbsp of rapeseed oil. Stir into the chick pea mixture along with the chopped parsley and season to taste. 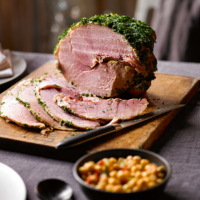 Thinly slice the gammon and with serve with dressing. This recipe was first published in Tue Nov 04 11:29:00 GMT 2014.